Astronaut John W. Young salutes the U.S. Flag. 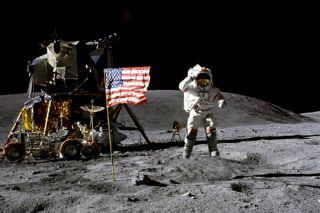 In this historical photo from the U.S. space agency, Astronaut John W. Young, commander of the Apollo 16 lunar landing mission, jumps up from the lunar surface as he salutes the U.S. Flag at the Descartes landing site during the first Apollo 16 extravehicular activity (EVA-1) on Apr. 21, 1972. Astronaut Charles M. Duke Jr., lunar module pilot, took this picture. The Lunar Module (LM) "Orion" is on the left. The Lunar Roving Vehicle is parked beside the LM. The object behind Young in the shade of the LM is the Far Ultraviolet Camera/Spectrograph. Stone Mountain dominates the background in this lunar scene.